Hello Friends! Today my card share is part of card drive that is going on over on the Understand Blue blog. Lydia has asked that we create a card for the greeter at her COSTCO. He is having double knee replacement and could use a little cheering up! Well, I can certainly understand that! To read more about the card drive and the giveaway opportunity, click HERE. 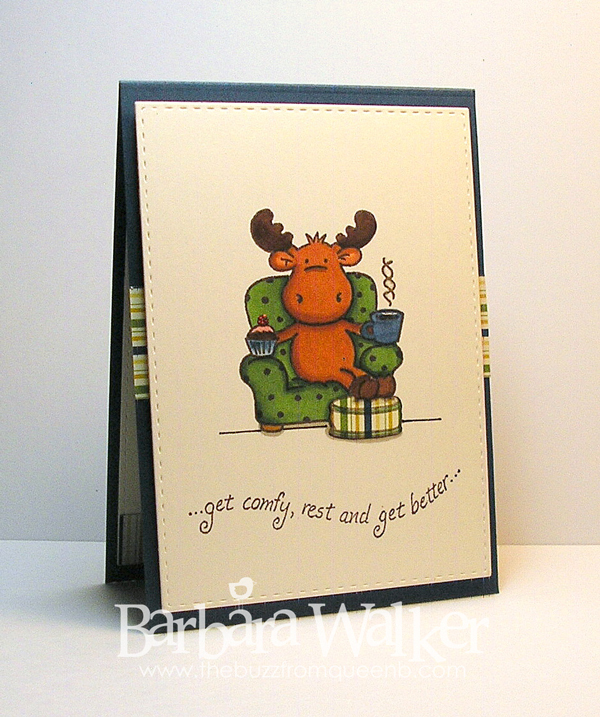 I dusted off a few old-timers to create this card; my Cupcake Riley Moose and a sentiment stamp from Lockhart. I've had these for years! I have taken a liking to the 4 Bar sized card and that is what I created here. First, I die cut a panel from a piece of ivory card stock, using a Simon Says Stamp Stitched Rectangle die. Then, I stamped the image and sentiment using Memento Espresso Truffle ink. Next, I colored Riley with Copic markers. I paper pieced his little ottoman, added Glossy Accents to his coffee and glitter to the cherry on top of his cupcake. I mounted the focal panel onto a piece of craft foam(like Fun Foam) to add dimension. I really do like it better than just the foam tape strips. The card is sturdy with zero chance of saggy areas. I adhered it all together with Be Creative tape, because it's extra strong. The focal was then adhered to my card base. 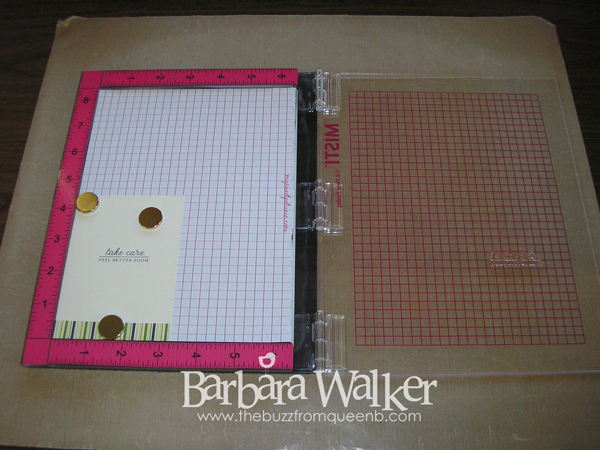 For the inside of the card, I used my new tool, the MISTI! 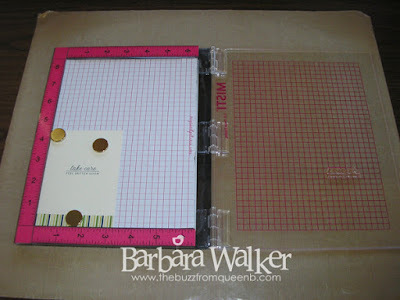 I was on the fence about this, because I have been using the Stamp-a-ma-Jig for years and years but, I kept seeing this tool pop up in videos and I loved how easy it was to use and how accurately it stamped the images. Soooo, I ordered one and I tell you what, I don't know how I ever stamped without it! It's worth every penny I spent. Stamping the inside sentiment was quick and easy with the MISTI. And I didn't have to worry about it being straight, because MISTI has a grid printed right on the lid. Fabulous tool! I know I will be using it all the time. Aaannd...that's all I have to share today! Thanks for stopping by! I LOVE your card! Thank you so much for sending some paper love Alex's way - you are a sweetheart. And I totally know what you mean about the MISTI - how did we do without it??? You are so thoughtful and generous, Barb! I think your card is fantastic and will most certainly bring a smile to this fine gentleman's face. What a lovely gesture. Your coloring looks fabulous! Congrats on getting the MISTI. I have to say, I've thought the same thing at first...why is this tool a must have? But, I keep seeing it used and can sense that it really is a great tool to have in one's stash. Now that you are on board, it really must be great. :) It's on my wish list, I'll say that. Hope you have a great day and thanks so much for sharing.